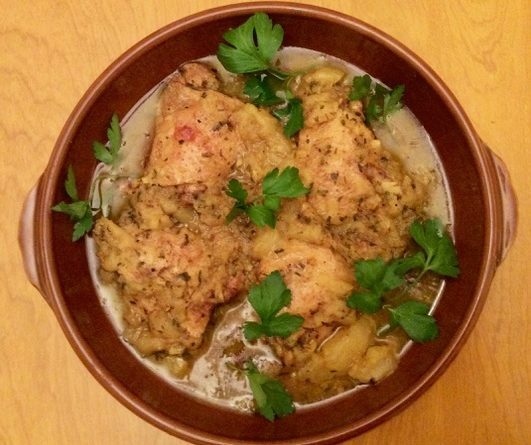 In a bowl large enough to hold the chicken in a single layer, mix together the salt, pepper, ginger, cinnamon, saffron, parsley and Tabasco sauce (if using) with enough water to make a paste. Add the thighs to the bowl, turning them until they are well-covered with the paste. Reserve. In a heavy bottomed pan just large enough to hold the thighs in one layer, heat the oil over medium heat, add the onion and sauté it until it becomes limp. Add the chicken and all the paste, stir in the garlic, the water and the cubed butter, bring to a slow boil, cover the pan with a lid, turn the heat to low. Now, prep the quince and, over medium heat, sauté the slices in 2 tablespoons butter, turning them often, until they begin to brown and turn a golden-orange colour—10 to 15 minutes. Add them to the pan and stir. Cover the pan again and simmer the tajine for another hour or so, adding a little more water as needed now and then; at the end, there should still be some liquid in the pan. 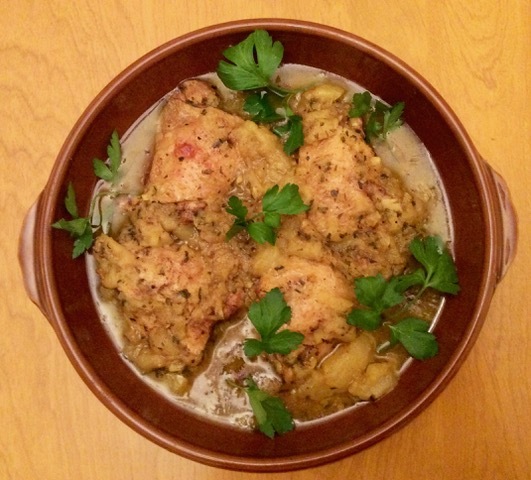 The tajine is done when the chicken feels tender to the touch. Before serving, check the seasoning and, if you wish, add a little lemon juice to brighten the flavour. Couscous and a green salad or vegetable go well with this. *Note: Quince can be found at Middle-eastern groceries, at Produce Depot or at Cedars. Pick the yellowest, most fragrant one without blemishes. If you cannot find quince, firm, flavourful apples are a good substitute. Use one very large apple or two smallish ones and treat it/them just like the quince in the recipe, but reduce the sautéing time to 5 minutes.